Where that you combine will always have with you happiness to divide. Nature offered the iron ore, the olive groves, the sun and the song of the cicadas, it was enough to add to it the complicity of a cutler and in love with its country so that is born the PROVENCAL, knife of Provence. Contrary to the industrial productions, this knife entirely produced with the hand has a heart and will become for you a faithful companion. 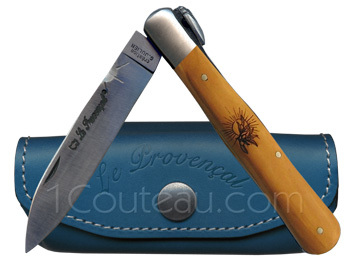 Its steel blade Sandvik 12c27 is guilloched with the emblem of the sun, its handle cut in régionnaux wood such as Olivier, associates the softness of the touch the perfumes of Provence. Its widened form points out the body of the cicada and ensures a perfect catch in hand. Its finely guilloched spring of sheets of olive-tree is decorated of a cicada, emblem of Provence and joy in life. G. Julien and Cutlery Au Sabot creation.